Have you ever been to the Mediterranean? While I can only dream of traveling there one day, I actually felt like I was transformed there recently without stepping foot out of Lehigh Valley ... in “good old” Pennsylvania. Just sit back, close your eyes, and imagine the thought of sitting amongst royal blue chairs and tables topped with crisp blue and white linens. Think large white columns and flowing sheer drapes hung from the ceiling. Then there’s the overstuffed white leather furniture to casually enjoy drinks and food as you sit looking at a mountainside full of abodes that have incredible views of the ocean painted on the wall. And, you can’t miss the fresh fish market-type approach which is represented as you enter the building and offers the days selection. Where, you might ask, was I? This is the atmosphere you’ll find as you dine at Yianni’s Taverna located in Bethlehem, Pa. One that should definitely not be missed on your choices of places to dine out in Lehigh Valley. I was fortunate enough to interview owners Melissa Zannakis and Maria Manakos, and they confirmed how special and authentic this place really is. You can watch the video episode to get a taste of what Yianni’s is all about. Or, you can read below to find out more. But, whatever you do, don’t leave this one off your list. Opa! Discover Lehigh Valley (DLV): How would you describe your cuisine? 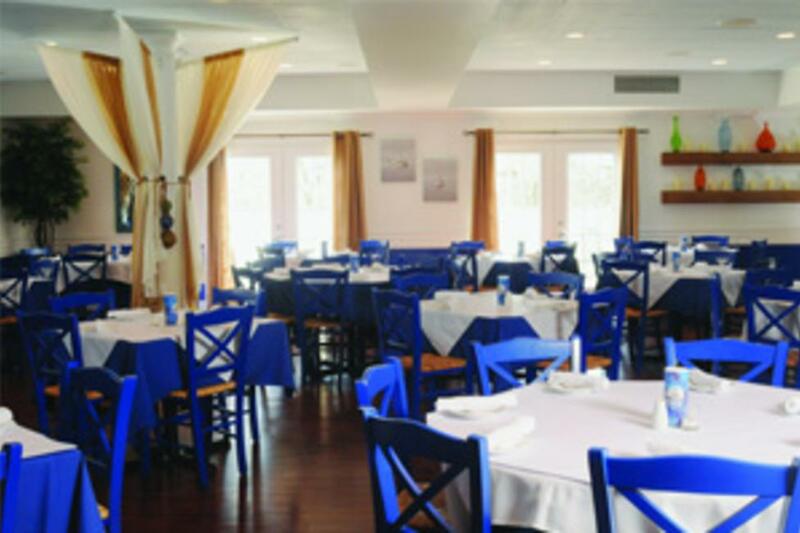 Yianni’s Taverna (YT): Our cuisine is a modern interpretation of classic Greek fare. DLV: What are some dishes that best exemplify your cooking style? YT: Braised Lamb Shank; whole fish preparation and tableside fillet; Kakavia, a Greek fisherman’s soup, similar to a cioppino; cast iron seared steak with fresh herbs and cracked pepper. DLV: To what extent are you involved with the local agricultural community, and does it influence how and what you cook? YT: We utilize Lehigh Valley seasonal produce using John and Irene’s connections with the local farmers. An example is our use of zucchini flowers and fresh roasted red beets. Since our beets are farm fresh we also serve beet greens as a specialty. DLV: What are some of your favorite cooking ingredients? YT: Greek wild oregano, Greek imported red wine vinegar, lemon, imported barrel-aged feta, and extra virgin olive oil (EVOO) imported from Kalamata Greece. DLV: When did you first develop an interest in the culinary arts? YT: The restaurant business was a way of life. We grew up in the business and grew to love it watching our grandmother cook for every day and family gatherings. DLV: What are your "tools of the trade”? YT: Natural wood charcoal for an open grill and spit cooking, and clay pots. DLV: Who are some of your culinary influences? YT: Our grandparents and great-grandparents whose recipes are used today. DLV: What was your first job in the food service industry? YT: Dishwasher and busboy. DLV: Do have any advice for aspiring chefs? YT: Make sure it is your passion. It is a great way to express yourself and your culture. And, always remember to keep it simple. DLV: Where did the name of your restaurant come from? YT: This restaurant used to be named after our father, Gus. As Greek tradition dictates, the family name is passed down through the generations. Gus is our father, hence the prior name of Gus’. Yianni is the grandfather, which is now the name of our restaurant. DLV: Did you have formal training or "hard knocks" university? YT: No formal training, just graduates of hard knocks. DLV: Who are your mentors? YT: Our grandparents played a huge role. DLV: What is the top selling item on your breakfast, lunch and dinner menus? YT: For brunch, it would be benedicts: lamb or spinach & feta are very popular. For lunch, it is definitely our Gyro which is homemade. And for dinner, the whole fish is the way to go. DLV: What do you feel sets you apart from other local restaurants? YT: Our cuisine and atmosphere which temporarily transports you to the Mediterranean, and ‘philoxenia’ which means a love of strangers. To us, it means you are part of our family. Our food is prepared fresh to order which gives us the ability to accommodate a wide variety of special requests. DLV: Besides your restaurant, what is your favorite Lehigh Valley restaurant? YT: Our cousin Billy! Billy&apos;s Downtown Diner which has locations in downtown Allentown and Bethlehem. And, it’s a toss-up, but we love Sette Luna in Easton, the Hamilton Kitchen and Bar in Allentown and Bolete down the street. Monday - Thursday 11:30 a.m. - 10 p.m.